I’m back, well I never went away to be honest just a whole lot of real life, preparing for Warlords and if I’m truly honest whole lot of writers block caused by generally feeling run down due to the real world stuff. I haven’t stopped playing WoW though and have been really busy working towards a very big goal which I hope to cover soon so i won’t spoil that just now (yes, I know I’m teasing you all). Anyway the biggest thing that is stressing me in game is the matter of loot in our soon to be Mythic raids, Exhumed has been a 10 man raid guild all the while I have been there, this has meant loot has been a simple affair as we have a fixed squad of 15 people and use /roll. Sure it isn’t perfect but 9 times out of 10 the RNG gods didn’t punish people to much as the chances of rolling against the someone for loot more than 2 times was almost nil and only our 2 enhancement shaman were rolling against each other for the same stuff as our hunter didn’t want mastery and they didn’t want crit, sure healers competed with our boomkin on some gear and I even competed with the mage and lock on an item or two but mostly it sorted itself out (unless you count the Prismatic Prison of Pride trinket which has dropped only 3 times for us on normal or heroic and our druid is still using a flex version despite having 33 kills (7x normal and 26x HC) and rolling on it each time too while I’ve got the normal version in my 43 kills (20x normal and 23x HC) and yes I roll each week as well and have all 5.4). Anyway I digress, the point is loot was drama free and fast to deal with. As we move to Mythic, we end up staring down the loot drama boss, RNG can play a huge part the options were all admin heavy and time consuming out of game and nobody wanted to do it and I wasn’t getting burdened by that on top of everything else I do for the guild, I simply don’t have the time. 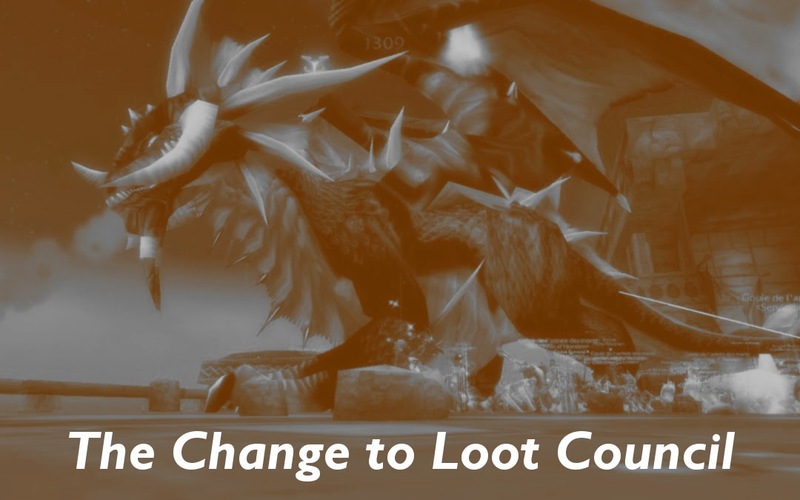 A few months back we polled the guild to see what they wanted from raiding in Warlords and one question we asked was which loot system they wanted, the majority chose Loot Council, but even that doesn’t come with admin problems. The biggest one is the time it takes to do in raids, I’m assuming that Mythic will give us 5 loot items per boss kill and I’m assuming that each item will take a minimum of 2 minutes to deal with, that’s 10 minutes per boss! With there being 17 bosses in the first tier of Warlords raiding that’s 3 hours per week just spent on dishing out loot and our raiding schedule is 2 nights of 3 hour raids which makes that 3 hours 50% of our raid schedule spent handing out loot. I’ve looked at addons to help, they’re either broken (not working cross-realm even for connected realms) or just don’t add up to a time saving as they don’t handle the loot council decision making process at all. This means I’m stuck looking at ways to make the process efficient. I’ve tried researching Loot Council and all I can find is what loot council is and how much better or worse it is than DKP, EPGP, /roll or Suicide Kings. One of the better articles I found, on World of Matticus, is a bit old but still relevant and I’ve used this as the base for the overview of how I see Loot Council working for Exhumed (I won’t go into too much detail of the differences as it is still a discussion for our officers). So this post is really aimed at people that are running a loot council already as I’d love to hear from you about how you deal with the bidding and decision making process without spending too much time per item, particularly from 25 man raid teams.